Aprons are not one type-fits all. Adhere to each unique position’s job requirements and materials handled to find the proper style for each individual! Ensure that your employees and staff are outfitted in the proper clothing to do their job well! Full-length bib aprons available in a variety of colour, sizes, and materials, with or without front pockets. Many restaurants, cafes, and food service establishments require that their back of house staff wear bib aprons, to protect their clothing from splatters and food residue. Aprons protect their uniform from the majority of major spills, and makes for easy and fast cleanup. Winco Heavy Vinyl bib apronavailable for dishwashers, as the water-resistant naugahyde material protects against splashes, and will keep the undergarments dry. 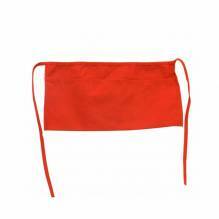 This high-quality apron provides good coverage for those who spend a lot of time with hot and dripping dinnerware, as well as those in close contact with water spray. 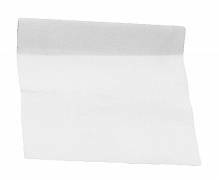 Help keep your servers and pantry chefs clean by providing them with the proper coverage! Zanduco carries a variety of waist aprons, in black and white, with 4-way aprons available for individuals whose clothes are susceptible to a lot of mess. Choose the aprons that will fit your café, restaurant, bistro, or catering service! 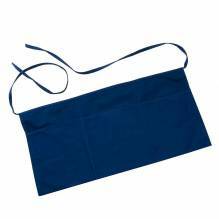 Black server waist apron available featuring a large amount of pockets, to aid those servers in a busy environment, who need to hold pens, notepads, check holders, wine openers and change! With long adjustable straps, these aprons are one-size-fits all, and provide a place for bar cloths to be easily accessible to the wearers, a no brainer for food service establishments! These poly cotton blend aprons can be thrown in the wash for a quick clean, and can be relied on to withstand many uses and wears. The proper apron will bring your establishment nothing but benefits; opt for a more elegant style of apron for cafes and bistros, with a white and black pinstriped bib apron. Protective aprons are available for cleaning, and for handling messy products or harmful materials, as well as well as stainless-steel mesh aprons for butcher shops and meat manufacturing operations!